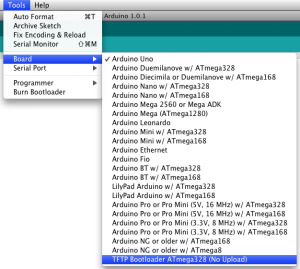 Although it is fairly straight forward to upload a sketch to your Arduino by plugging it into your computer, there are certain times when this can be very inconvenient. If, for example you have an Arduino under your house collecting temperature and humidity values and you need to push a bug fix to your board it can be a real hassle to get under your house with a laptop and updated your firmware! This is where this tutorial comes in. 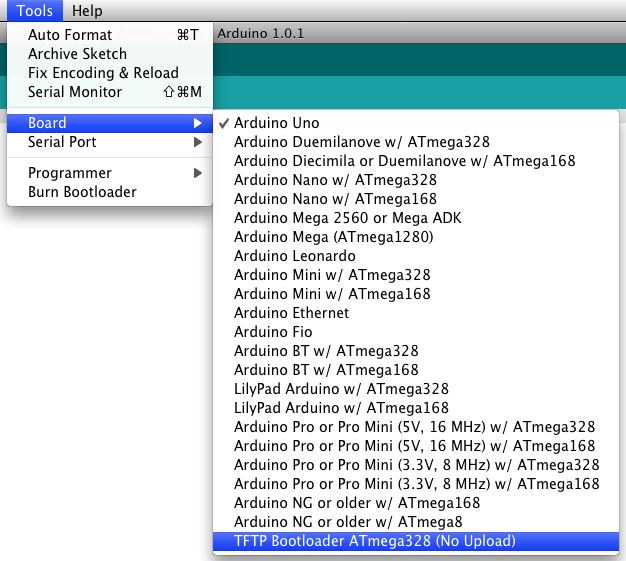 With the help of a protocol called the Trivial File Transfer Protocol (TFTP) you can easily upload sketches to Arduino boards that are connected to your home network, right from the comfort of your computer. To get started learning this useful skill check out the following link. If you are looking to for an Arduino board with network capabilities why not checkout the Freetronics EtherTen. The EtherTen is a 100% Arduino compatible board that can talk to the world. Do Twitter updates automatically, serve web pages, connect to web services, display sensor data online, and control devices using a web browser. Check out the following link to find out more.